Local governments have the power to affect the main sources of pollution directly linked to climate change: energy use, transportation, and waste. Cities control the day-to-day activities that determine the amount of energy used and waste generated by their community - from land use and zoning decisions to control over building codes and licenses, infrastructure investments, municipal service delivery and management of schools, parks and recreation areas. A range of actions can be incorporated into these operations to reduce associated global warming emissions. Local governments are uniquely positioned to influence citizen behaviors that directly affect climate change such as transportation options, energy consumption patterns, and general consumer decisions. 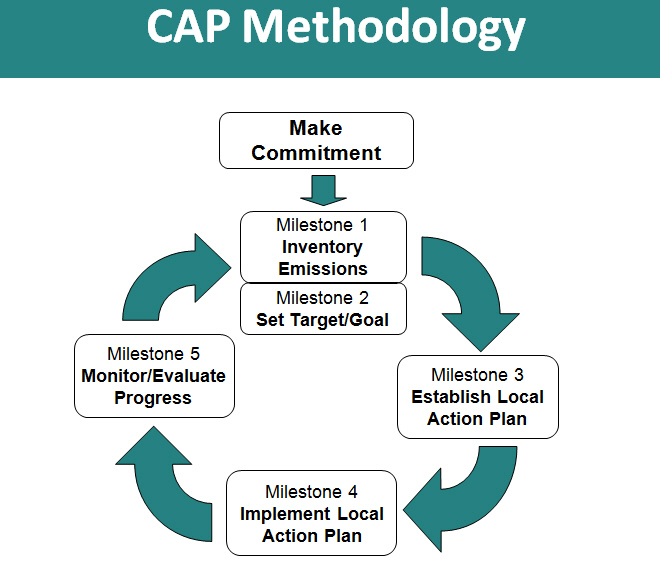 CAP - Climate Action Plan - Focuses primarily on reducing greenhouse gas emissions, including emissions resulting from both the local government’s operations and from the community as a whole. It typically includes an analysis of the opportunities to reduce greenhouse gas emissions resulting from energy use in transportation, solid waste disposal, buildings, lighting, and waste water treatment and water delivery. A few local governments also include environmental opportunities beyond reducing energy consumption—such as natural resources, urban forestry, and green jobs. A climate action plan often addresses the co-benefits of its initiatives, in terms of improving air quality or reducing storm water runoff. Community Protocol - The Community-Scale GHG Emissions Accounting and Reporting Protocol - The forthcoming U.S. national standard for how to measure and report a community's greenhouse gas emissions. On July 9, 2012, the draft Community Protocol was released for public comment. All comments will be due by July 30. The final Community Protocol will be released Sept. 10, 2012. LGO Protocol - Local Government Operations Protocol - The U.S. national standard guidebook on how to quantify and report greenhouse gas emissions from local government municipal operations. Conduct a baseline inventory - An inventory identifies and quantifies the global warming pollution produced by both government operations and the community at large in a particular year. The inventory and forecast provide a benchmark against which the city can measure the progress in terms of its own operations and that of its citizens. This emissions analysis identifies the activities that contribute to global warming pollution and the quantity of pollution generated by each of these activities. An inventory is established by collecting data about energy management, recycling and waste reduction, transportation, and land use. and for a forecast year (e.g. 2020). Expertise in climate science is not necessary. A wide range of government staff members, from public works to environment and facilities departments, can conduct an inventory. Establish a target to lower emissions - Setting a reduction target for global warming pollutants creates a tangible goal and metric to guide the planning and implementation of your community’s action. The target in the U.S. Mayors’ Climate Protection Agreement is to reduce emissions by a minimum of 7 percent below 1990 levels by 2012. Almost all of the local governments participating in ICLEI’s CCP Campaign establish reduction targets of global warming pollution at 15 percent or higher to be met within a 10 year period. Develop a local Climate Action Plan - A local Climate Action Plan (CAP) is a customized roadmap to reduce global warming pollution by the target that your city has identified. 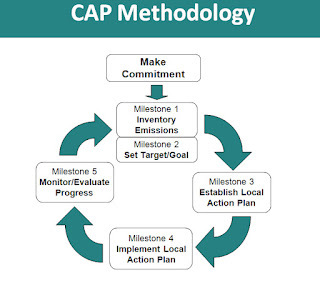 The CAP includes an implementation timeline for reduction measures, costs and financing mechanisms, assignments to city departments, and actions the city must implement to achieve its target. The inventory and quantification of existing climate protection measures helps guide a city to understand where they can get the largest emissions reductions. Good CAPs also have information on how the identified measure/policy/strategy is going to be implemented. Implement the local Climate Action Plan - Successful implementation of actions identified in the local Climate Action Plan depends on a number of factors including management and staffing, financing, a realistic timeline and stakeholder involvement in appropriate aspects of the Plan to build community support. Measure, verify and report performance - Verification of progress ensures integrity and accuracy in the city’s efforts to achieve its global warming pollution reduction target. The reductions that a city achieves through implementation of actions to reduce global warming pollution must be monitored to measure progress. Tracking progress builds political support, informs the process and often drives further city investment to advance climate protection. Save Taxpayer Dollars - Actions that reduce global warming pollution also reduce electricity and fuel use, minimizing energy costs for citizens, businesses and local governments. In 2005, through ICLEI’s Cities for Climate Protection (CCP) Campaign more than 160 U.S. local governments reported collective savings of over 23 million tons of global warming pollution and $600 million in related energy and fuel costs. Build the Local Economy and Create Jobs - Decreased energy costs and the provision of new energy services and technologies (e.g. energy efficiency and renewable energy) give local government and private firms a competitive edge. Demand for energy efficient products and services and for new or alternative energy technologies expands local business and creates local jobs. Improve Air Quality and Public Health - Reducing global warming pollutants also helps cities comply with federal air quality regulations and preserves federal funding for local projects. These strategies ultimately create less air pollution, which results in fewer air quality-related public health impacts, such as asthma and other respiratory ailments. Improve Community Livability -Cutting global warming pollution includes measures that also reduce auto dependency and traffic congestion, clean the air, and contribute to more efficient land use patterns and walkable neighborhoods. In combination, these types of measures can help build a more livable community. Connect Cities with National Leaders and Resources - The expanding network of cities committed to advancing climate protection represent U.S. MCPA signatories, CCP cities and member cities of the U.S. Conference of Mayors. Create a Legacy of Leadership - Taking action on climate change provides tangible benefits for citizens today – and ensures that future generations will have access to the resources that support healthy, prosperous, and livable communities. Not Silver Bullet - Climate action plans are en vogue these days, but planners should be cautious of viewing them as silver bullets. While climate action plans — which may include baseline information on GHG emissions, targets for reducing these emissions, and strategies for achieving GHG reduction goals — can be useful tools for communities, these plans alone may not be enough to fully address energy and climate issues. As Stephen Wheeler points out in "State and Municipal Climate Change Plans: The First Generation" (Journal of the American Planning Association, Autumn 2008), many of these early plans lack adequate strategies and measures, few address adaptation, and implementation is problematic. These plans also vary greatly in content, with many focusing on municipal strategies such as greening vehicle fleets and public buildings, without addressing important areas in land use and transportation where planners can help make a difference. This may be due, at least in part, to the fact that some of these plans are being prepared outside of the planning department, sometimes with little input from planners. Adaptation - Many CAP's do not address Adaptation. NIMBY - Denser zoning and other land use changes incorporated in a CAP may be viewed as good ideas when putting together a theoretical plan, but may not be popular with local residents when implemented. Property Rights / Opposition to Land Use Restrictions - The opponents of the plan said they want to let the free market determine where and what type of housing would be built. One man stood up and shouted, "If we need stack and pack housing because there's a sufficient market for it, and people are willing to pay for it, it will get built without your intervention." Personal Automobile Lifestyle - Most American suburbs and many cities have been built around the personal automobile "You're going to make it harder for the middle class to use their cars. Their cost of living is going to go up, and so how are low income people going to move up, have upward mobility?" Goals of related plans - When possible, planners should take a leading role in the preparation of these documents to ensure a more comprehensive approach. ICLEI USA has compiled this list of cities', towns', and counties' climate action plans, sustainability plans, and general plans with sustainability or climate elements. The list includes both ICLEI member and nonmember U.S. local governments, and was last updated 11/30/09. Berkeley CAP - The community’s target for the year 2020 is to reduce community-wide GHG emissions 33% (below 2000 levels). As of 2010, the community achieved nearly 50% of its year 2020 target for diverting waste from the landfill, over 20% of its electricity reduction target, and approximately 6% of its natural gas reduction target. Emeryville CAP - By 2020, the City plans on reducing emissions from the whole community and the government operations by 25% over 2004 levels. ICLEI - Bonn, Germany - ICLEI USA - Oakland, CA - originally stood for the “International Council for Local Environmental Initiatives,” but in 2003 the organization dropped the full phrase and became “ICLEI-Local Governments for Sustainability” to reflect a broader focus on sustainability, not just environmental initiatives. This project is surely going to be very beneficial for as long as the community participates well. I suggest they also put up some cfp filter press units on specified areas.